HOLLYWOOD FLORIDA – Dr. Nora Volkow, Director of the National Institute on Drug Abuse, addressed an audience exceeding 500 people at the joint Plenary Session of the College on Problems of Drug Dependence (CPDD) and the International Narcotics Research Conference (INRC) on Wednesday, June 22. She began her address by noting that joint scientific meetings such as this increase the strength of science by enabling new partnerships to form. Dr. Volkow touched on a number of themes during her address. She noted that the Monitoring the Future Report documents recent successes in the form of declines in adolescent cigarette smoking, consequent to successful no-smoking media advertising, but that an alarming trend exists suggesting increased marijuana use by 12th graders. Marijuana use by this age group is influenced by the public perception of marijuana’s harms, and Dr. Volkow suggested that the public may be developing a false sense of security about the dangers of marijuana as a result of medical marijuana campaigns. She noted that prescription medications are being abused increasingly by people in all age ranges. While marijuana remains the top drug abused by 12th graders, psychotherapeutic drugs also are being abused by people in this age range. An increase in abuse of opioids, which can be toxic, has been accompanied by an increase in opioid overdose deaths. Dr. Volkow did not comment at length about the proposed NIDA/NIAAA structural merger, but did mention that it now is delayed for about a year. Dr. David Shurtleff, Acting Associate Director of NIDA, discussed the merger process in detail at the CPDD 2011 Public Policy Forum. Dr. Volkow did remark that for first time in many years, NIH is being subjected to a budget cut, which is having a large impact across all NIH Institutes including NIDA. The cut amounts to about 1% versus prior year funding, which when combined with a 3% inflation rate, translates effectively to a 4% cut. Dr. Volkow noted that Institute Directors are working to preserve the numbers of grants that will be funded, and are focusing specifically on protecting young investigators, who will be funded at higher scores than regular investigators, to help keep them in the field. Dr. Volkow next addressed a concern expressed by some in the research community that NIDA is devoting too much of its funding to medications development initiatives. She noted that only 12% of the NIDA overall FY2010 budget was allocated to this part of the portfolio. Dr. Volkow noted later in her address that ARRA funding successes in the medications development program have helped to establish a new funding paradigm: the data suggest that it is advantageous to conduct large budget (currently up to $5 million), shorter time frame (currently 3 year) grants with very specific aims. Next, she commented on research areas in which she believes that opportunities exist and breakthroughs will occur. Dr. Volkow discussed at length the preclinical and clinical data supporting the ideas that genetic variability of cholinergic receptor genes CHRNA5/A3/B4 moderates vulnerability for nicotine dependence and that the habenula plays a key role in modulating the balance between rewarding and aversive stimuli. She noted that the increased appreciation of how withdrawal effects moderate vulnerability to addictive disorders has been transformative. Another promising development is the increasing use of functional MRI (fMRI) to characterize resting state brain networks, which may advance our understanding of brain signaling in healthy people and in those with addiction disorders. She raised the intriguing possibility that the technique could be used to help identify people who may be vulnerable to developing addiction disorders, and it also may help to identify effective treatments. The technique works by identifying different brain areas in which fMRI signal oscillations are highly temporally correlated, suggesting that they are functionally connected. Dr. Volkow pointed out that measurements of the resting state brain network, also known as the default mode network, are very stable within healthy individuals and replicable across research sites. She suggested that developing a very large resting state network database could advance substance abuse research and illustrated this point by conducting her own analysis of resting state connectivity from the nucleus accumbens and the habenula using a large open access dataset. She placed habenula and nucleus accumbens seed points and found connectivities consistent with reward and aversion circuitry, respectively (e.g., the amygdala was predominantly connected with habenula but not with accumbens). Dr. Volkow noted that open access databases (e.g., The Human Connectome) are becoming key tools in advancing science. She indicated that 12 NIH Institutes are working together to develop an open access neuroimaging database. Issues that remain to be resolved are standards for data collection (e.g., eyes open vs. closed; 5 vs 7 vs 10 minute resting state samples), phenotyping (what measures will be included, e.g., body mass index, cognitive performance, etc. ), how a repository should be structured, whether it should it be mandatory, and which imaging modalities should be implemented first. Next, Dr. Volkow commented on a NIDA-sponsored research study published in the New England Journal of Medicine showing that buprenorphine treatment of pregnant opioid-dependent women is better than the standard treatment (methadone) in a number of ways, including by reducing length of hospital stays from 17.5 to 10.0 days. 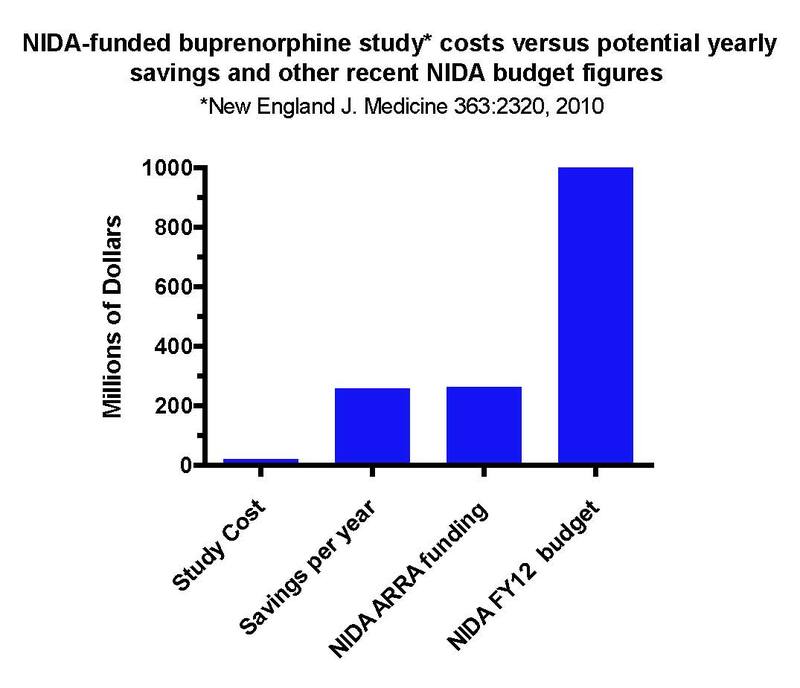 She then projected that this 7.5 day difference, when multiplied by the cost per hospital day ($1,500) and the number of pregnant women needing treatment for opioid dependence (23,000/year), amounted to a potential public health cost savings enabled by this research study of $259 million/year (more than a quarter billion dollars, slightly less than the NIDA ARRA allocation, and if added up over 4 years saves enough to fully fund NIDA at FY2012 budget levels)! This scales to a remarkable 12.8:1 (1-year) return on investment for a study Dr. Volkow reported cost NIDA $20.3 million, and illustrates that NIH-funded research is a great and lasting value. Next, Dr. Volkow presented her “Brain of the Year” research study, which documented that second hand smoke is sufficient to affect nicotine receptors in nonsmokers. She asserted that this finding is key because it has the potential to drive public health policymaking decisions, including whether additional restrictions should be instituted to protect children from second-hand smoke. CPDDBLOG welcomes CPDD member’s thoughts on these issues.